The original image of HD 15115, captured by Hubble, revealed that the disk around the star is stretched out asymmetrically, leaving astronomers puzzled for over a decade. For over a decade, a warped disk around a young star puzzled astronomers — but new research now suggests explanations for two of the star's perplexing mysteries. A newly spotted second ring in the star system suggests that far away from the parent star, an ice giant is lurking beyond the realm of current detection technology. Researchers also discovered that only the smallest particles of the disk are warped, with larger material more evenly spread around the star. Here's how the mysteries began: In 2007, NASA's Hubble Space Telescope revealed a lopsided ring around the young star HD 15115, which is located about 150 light-years away, where one side of the disk extends twice as far as the other. Astronomers proposed a number of possible explanations for the warp, including strange tugs from its distant companion star or planets hurled out of the system. But scientists weren't quite sold on these solutions. In hopes of discovering the source of the asymmetry, Meredith MacGregor, an astronomer at the Carnegie Institution for Science in Washington, D.C., turned the Atacama Large Millimeter/submillimeter Array (ALMA) toward the star. In addition to the smaller particles that Hubble saw, which are related to gas and other light material, ALMA also revealed the larger dust particles that were left after planetary formation. "Surprisingly, we don't see the asymmetry at all," MacGregor told Space.com. "Instead what we see is, it looks like there's evidence that there's two rings in the disk and a gap in between them." MacGregor presented her results at the 223rd meeting of the American Astronomical Society in Seattle in January. After a star is born, the leftover gas and dust slam together to form planets. Eventually, most of the gas and dust are either gathered into the newborn worlds or stripped away from the new system by stellar winds. But in about a quarter of cases, some of the material remains in a massive belt surrounding the star. These debris disks are much like the asteroid or Kuiper belts found in our solar system, but far more massive. They are made up of either ice or rock depending on how close they lie to their star. ALMA's images reveal that HD 15115 is now part of an elite club — with a membership of two — known to boast two separate bands of material inside of a debris disk. So far, only one other star, a young sun-like star known as HD 107146, has more than a single observed belt. It's possible, however, that other stars have both an exoasteroid belt and an exoKuiper belt, but that they are too faint to observe. Current technology would not be able to pick up on our solar system's own pair of faint rings. The two belts surrounding HD 15115 are separated by a narrow gap that MacGregor said has been cleaned of almost all of its material. Clearing out this gap, and keeping it empty, requires more than just chance — it requires something hugely massive. 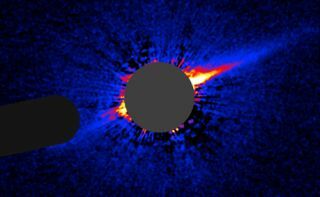 "The easiest explanation for why you would have maintained two debris belts that are separated by a cleared-out gap is that there is some kind of planet sitting in that gap," MacGregor said. The needle-like image of HD 15115 revealed a disk of material that stretched farther on one side than the other. Astronomers now think that only the lightest particles are stretched, while larger objects remain in a more circular disk. In our solar system, the icy Kuiper Belt was shaped by gravitational interactions with Neptune. A similar process most likely sculpted the gap around HD 15115, according to MacGregor. But right now, we can't see the culprit planet. That's because each current planet-hunting technique is limited in what sort of worlds it can detect. NASA's planet-hunting Kepler Space Telescope relied on the transit method, in which a planet passing between Earth and its star blocks the starlight. Because of the relatively short lifetime of such surveys and the need to collect multiple passes from the planet, the method is limited to worlds that orbit near their star. The radial velocity method measures the gravitational tugs a planet makes on its star, but planets capable of creating a stellar wobble tend to be larger and closer in. Direct imaging can capture the glow of planets that lie far away from their star but can spot only young worlds because as a planet ages, it cools and gives off less of a glow. All that means that cooler ice giants far from their star — worlds more like Uranus and Neptune than the gas giants Jupiter and Saturn — are rare treasures. The newfound gap in HD 15115 lies nearly 60 astronomical units from its star. (One astronomical unit (AU) is the distance between Earth and the sun.) At such a distance, the cold temperatures suggest that any planet would be an ice giant. Right now, the unseen planet's size and mass remain a mystery, but MacGregor and her colleagues hope to use models to better understand it. Creating the right-size gap requires a planet be massive but not too massive, she said. With these models, "you can infer the presence of something we would not otherwise be able to detect," MacGregor said. The research has been submitted to the Astrophysical Journal Letters. In addition to revealing a potentially unseen world, the new results are also helping to solve a decade-old mystery behind the strange shape of the disk around HD 15115. Hubble's original observations revealed a strange, needle-like shape to the disk of the star. The east side of the disk stretches out to 315 AUs, while the west side extends just over 550 AU, creating a massive asymmetry. Hubble glimpsed the small gas particles leftover after most of the original disk was blown away. According to MacGregor, this material is made up of small, light particles that may be easily moved by other objects. In contrast, ALMA probed the larger, heavier particles that she said should have remained more stable. These particles revealed that the disk isn't quite as imbalanced as it appears through Hubble's perspective. Instead, the larger grains are evenly dispersed around the star, maintaining a stable, disk-like shape. Originally, scientists thought HD 15115's distant companion star may have had a hand in warping the disk, with potential orbits allowing it to zoom by and drag away some of the material to create the needle-like structure. Or perhaps a fly-by from a completely independent star did the trick, astronomers thought. But a close pass by the companion star or a free-floating neighbor wouldn't leave behind the larger particles ALMA saw, MacGregor said. Instead, she suggested the warp might come from a collision with material floating in the space between the stars. As HD 15115 traveled around the galaxy, it may have come in contact with a dense cluster of dust and gas. Such a collision could have slowed the lighter material while the heavier debris continued to plow forward, leading to a disk that was oddly stretched in Hubble's eyes but not in ALMA's. ALMA continues to study debris disks, and researchers hope it will continue to reveal more stars with multiple rings of material around them. Observing more than two of these objects will help scientists to understand how debris disks form and evolve. "ALMA has really revolutionized our picture of debris disks," MacGregor said. Follow Nola Taylor Redd on Twitter @NolaTRedd or Facebook. Follow us on Twitter @Spacedotcom and on Facebook.